By The Ohio Chemical Manufacturing Co. Dated 6-45. Size medium. The mask looks very good and is lovely and flexible retaining good overall shape. The rubber is a bit grubby and there is minor cracking/crazing on the rubber section of the harness. This is much more obvious in the photographs and really does not detract. The webbing harness and oxygen hose are very good bar light surface corrosion on metal parts. 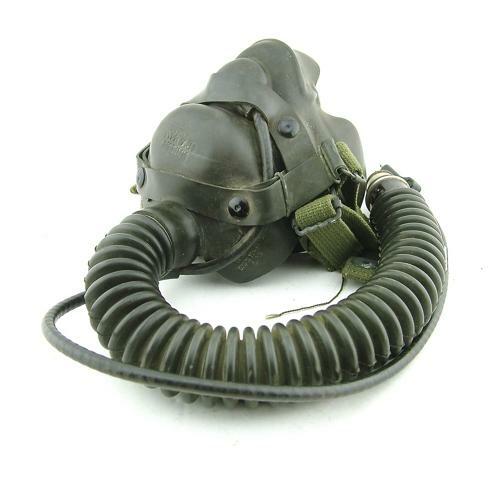 This mask is fitted with an ANB-MC-1 microphone, loom and 2-pin PJ-292 plug. A great display piece. Stock code O22904.